The Rt. Rev. J. Scott Mayer, bishop of the Episcopal Diocese of Northwest Texas, was elected provisional bishop of the Episcopal Diocese of Fort Worth at a special meeting of Convention on May 16 at Trinity Episcopal Church, Fort Worth. Delegates also voted to accept the resignation of the Rt. Rev. Rayford B.High,Jr., effective June 30. A luncheon followed the election and installation, with food provided by All Saints’, Fort Worth; Trinity, Fort Worth; St. Martin-in-the-Fields, Keller; and St. Alban’s, Arlington. Mayer will assume his new duties prior to the 2015 General Convention of The Episcopal Church in Salt Lake City June 25-July 3. He will work with the deputation – elected lay and clergy deputies to General Convention – from Fort Worth as well as the deputation from Northwest Texas. Mayer will continue as bishop of Northwest Texas while also serving as bishop of Fort Worth. He will split his time between the two dioceses. The dioceses are not merging. This model of episcopacy is similar to the arrangement with the Rt. Rev. Edwin F. (Ted) Gulick, Jr., the diocese’s first provisional bishop who also was serving as the bishop of the Episcopal Diocese of Kentucky at the time. A similar arrangement currently exists with the Rt. Rev. Sean Rowe, who serves as bishop of the Episcopal Diocese of Northwestern Pennsylvania and as provisional bishop of the Episcopal Diocese of Bethlehem (PA). The previous two provisional bishops of Fort Worth have been retired. The Rt. Rev. C. Wallis Ohl, Jr., the second provisional bishop, was the retired bishop of Northwest Texas when elected. Bishop High had retired as bishop suffragan of the Episcopal Diocese of Texas when he was elected. Mayer is a native and lifelong Texan, born in Dallas and raised in Lubbock and Fort Worth. Mayer has long and deep connections to Fort Worth. He and his younger brothers were baptized and confirmed at St Andrew’s Episcopal Church in Fort Worth, attended Fort Worth public schools, graduated from Southwest High School, and enjoyed memorable summer days playing ball at University Little League. Several family members continue to reside in the Fort Worth area. In 1977 Mayer received his BBA Degree in Management from Texas Tech University. He and Kathy Kistenmacher met while attending Texas Tech, and were married in 1978. After twelve years of sales in the automotive aftermarket, the family moved to Austin where Mayer earned a Masters in Divinity from the Episcopal Theological Seminary of the Southwest in 1992. Bishop Mayer was ordained deacon in 1992 by the Rt. Rev. Donis Patterson and priest in 1993 by the Rt. Rev. James Stanton, both in the Episcopal Diocese of Dallas. He then served as curate at St James Episcopal Church in Texarkana, before being called to the Church of the Heavenly Rest in Abilene – first as associate rector in 1994, and then as rector in 1995. 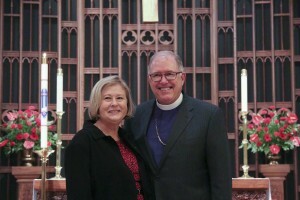 He was consecrated as bishop of the Diocese of Northwest Texas on March 21, 2009 in Lubbock, where he and Kathy now reside. The Mayers have two grown children, both married, and two grandchildren. Read an interview with Bishop Mayer. Watch a video of Bishop’s Mayer’s remarks to convention. Watch a video of excerpts from Bishop High’s sermon at the opening worship of convention. See even more photos at the Diocese of Northwest Texas Google gallery, courtesy of their Director of Communications and Human Resources, Deacon Nancy Igo. Browse our social posts about Convention and installation in this Storify story.